1. Mattress and Pillow Encasements. These bed bug proof enclosures are extremely affordable and provide a seal around your mattress, your pillows, and your box spring that is impenetrable to bed bugs. A super easy way to protect yourself. 2. Bed Bug Traps and Monitors. These offer sure fire bed bug protection by luring in bed bugs and trapping them. 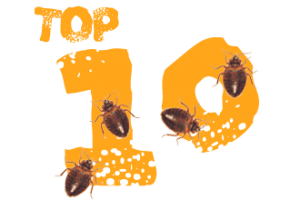 Not only does it protect your home from an existing infestation, but these traps can also be used as a preemptive strike allowing you to know as soon as bed bugs even attempt to get a foothold in your home. 3. Portable Bed Bug Heaters. Bed bugs hate the heat and a portable steamer allows you to quickly eradicate bed bugs from articles of clothing, furniture, pillows, towels, curtains, etc without harming anything you put in it. 4. Sealed Luggage and Clothing Liners. If you go on a trip, make sure you pack all of your clothing inside sealed, bed bug proof bags and that you line the inside of your luggage with a bed bug proof lining. 5. Climbup Interceptors. These handy devices are extremely cheap and go on all the feet of your bed frame. When a bed bug tries to climb up, they get caught by the interceptor rather than making a home in your bed. 6. Organic Chemicals, Powders, and Sprays. There is a wide array of chemicals, powders, and sprays that are all natural and non-lethal to pets and children. These can help you both eradicate an existing infestation or prevent a future one from occurring. 7. Non-Organic Chemicals, Powders, and Sprays. If you’re looking for a much more powerful punch than the organic option listed in number 6, there are also a wide range of much more lethal bed bug chemicals, powders, and sprays. 8. Bed Bug Steamers. If you find yourself with a bed bug problem, you need to kill the buggers where they live. A bed bug steamer allows you to penetrate extreme heat into your furniture, bed, and every other nook and cranny of your home. These devices are an absolute must for anyone who needs to kill bed bugs dead and make sure they do not return. 9. CO2 Montor. This cool little device emits a small amount of CO2 (carbon dioxide) which is what attracts bed bugs to humans while they sleep. Once the bed bugs enter the unit, they cannot escape. This device will let you know definitively whether or not you have a problem or help you to make sure you’ve eliminated the pests once and for all after an infestation. 10. Bed Bug Proof Laundry Bag. If you’re in a situation where you need to do laundry in a laundromat, a bed bug proof laundry bag can protect your clothing from picking up any hitchhiking bed bugs after you’ve cleaned your laundry. They can also be washed, so bugs on your clothes have no chance of escape. Each of these tools provide different forms of bed bug protection that can help keep you and your family safe. During the course of my infestation, I had to use a large number of these products. There are a lot of tools of the trade, so make sure you do your research and find the appropriate weapon (or weapons) with which to do battle with the bed bug enemy. For more information on protecting yourself from bed bugs, check out the remove bed bugs guide.